2nd meeting same day: 6-8pm Yreka Community Center, 825 North Oregon St.
Dec.15, KBRA 'Coordinating Council' public meeting. Your Public Comments will not be recorded. PacifiCorp, counties reach dam deal, H&N, posted to KBC 11/14/10. "Opponents of the dam removal had argued for years that local residents had been excluded from negotiations." Vote against (Klamath) dam removal stunning, Siskiyou Daily News by Siskiyou County Water Users Association writer, 11/10/10. “The successful vote against dam removal is HUGE! Seventy-nine percent of Siskiyou County is against dam removal. Washington, D.C. won’t be able to ignore the voice of Siskiyou County people." Majority of Siskiyou voters are opposed to dam removal, (and other Siskiyou election results) H&N 11/5/10. Klamath Co. voters split on dam removal, KDRV, posted to KBC 11/4/10. "Measure 18-80, an advisory vote on whether Klamath County discontinue its participation in the KBRA, was a near split, with 48 percent voting 'yes' on discontinuing participation, and 51 percent voting 'no', as of Wednesday night. However, some say there was voter confusion over the phrasing of the measure. Opponents of the KBRA allege there was much more opposition than was reflected in the nearly 50-50 split at the ballot box." RERUN: “Steamroller KBRA” followed by Valid Alternatives to KBRA, Settlement instead of Agreement, by William Kennedy 7/27/10, Klamath Falls, OR, Pioneer Press. "Do you approve of a process that manipulates perception as truth and results in giving someone’s property away without their engagement? Do you support a process of limited negotiations that strays far away from anything that looks like democracy and excludes true stakeholders in order to reach a predetermined outcome?" Nov. 2 - Klamath Falls: Chamber members ask for vote (on KBRA); Some disagree with board’s stance on Measure 18-80, H&N. KBC NOTE: Frank Goodson, and many people in Klamath Chamber of Commerce, object to the executive board's vote supporting the KBRA without polling their membership. As with the years of secret meetings creating the KBRA with no public allowed, Steve Kandra (on the KBRA negotiation table) said, "They’re not yielding to what I’ll call the ideology of Frank,” he said, referring to Goodson." Klamath Basin Restoration Agreement Finalized, Sublegals: Vol. 16, No. 2, 15 January 2010 - Pacific Coast Federation of Fishermen, and Institute for Fisheries Resources. "The KBRA also establishes a separate, science-driven 50-year fisheries habitat restoration process and a program to curtail higher upper basin irrigation withdrawals and put between 130,000 to 230.000 additional acre-feet of water annually (annual amounts varying depending on rainfall) into the lower river to aid salmon restoration." Rerun: State board okays a dam on Klamath, The Triplicate, re-posted to KBC 8/24/10. "The department was instrumental in getting the federal power commission to order the company to build the dam to regulate the stream, which has fluctuated in such a manner as to cause frequent fish kills and endanger human life on the Klamath below the existing COPCO dam." Builders start job on Klamath dam, Triplicate 4/16/10. "...While the dam site is about 200 miles upstream from the mouth, following the twisting course of the river, the project is being hailed as a boon to Del Norte because it furnishes additional assurance of adequate power for the area and because fishing in the already famous fishing river is expected to improve." Sustainable Northwest supports local solutions, H&N letter 10/30/10. KBC LINK: Sustainable NW on KBC Whose Who page:" ...I wonder if (the founder Martin Geobel's) foundation/his global power company could have a conflict of interest related to power generated by those “renewable” Klamath dams they want removed?" Becky Hyde, on Whose Who Page, at KBRA table, employed by Sustainable NW ($63,835 in 2007), which has worked for Klamath Tribes. Sustainable NW also paid Natural Heritage Institute $112,487 in '07 for legal fees. NHI is funded by Sierra Club, Trout Unlimited, American Rivers, Environmental Defense, The Nature Conservancy, World Bank, NRCS, California Dept of Water Resources, Calif. State Coastal Conservancy, National Marine Fishery Service, Bureau of Reclamation, Dept of Interior, National Park Service, USGS, Hydropower Reform Coalition; there are 87 NGO's, gov't agencies, foundations and universities supporting NHI. "NHI represents American Rivers and California Trout in an ongoing effort to decommission PacifiCorp’s Klamath River Project." "Sustainable NW supports LOCAL SOLUTIONS"???? NOAA awards more than $800,000 to American Rivers, 2007. The KBRA stipulates that that KBRA document, including water allocations to ag, will be altered to conform to the climate change studies. HERE for Preparing for Climate Change in the Klamath Basin. Many government agencies, tribal biologists, and environmental groups listed at the end of the document are surely looking out for our best interests. Posted to KBC 10/21/10. Preparing for Climate Change presentation at OIT October 25th "The research also addresses how to prepare for climate change in the areas of economic development, water quality and quantity, invasive plants, forest management, agriculture, and public health and safety." Tribes and farm leaders are bringing their political agenda to the potato festival, hosting a rally to get voters to support the KBRA: removal of 4 hydroelectric dams that supply power to 70,000 households, flood control and water for agriculture in Siskiyou County, giving land to the tribes that they sold, downsizing agriculture, years of secret meetings devising the plan that effects our water rights, and putting water for bird refuges and fish above water for agriculture. Karuk spokesman Craig Tucker, past environmental activist trained by Green Corp to destroy the American infrastructure, is bringing salmon to the BBQ. Views differ on sale of Mazama Tree Farm, H&N, posted to KBC 10/5/10. A related link: Chapter V "The Termination" from Carrol B. Howe's book: Excerpts from: Unconquered Uncontrolled - The Klamath Indian Reservation 1992. Fish, economy connected through water, Upper Klamath Lake needed both for irrigation and endangered fish, H&N 9/29/10. “The salmon were never up here on a consistent basis. The Klamath Tribe subsisted on the sucker fish because there were never salmon up here,” Mallams said. “Why would they eat sucker if they had salmon?” Stakeholders, administration officials meet, H&N, posted to KBC 9/28/10. (Family Farm Alliance executive director) Keppen used the Klamath Basin Restoration Agreement as “a specific example of where innovative things were happening,” coordinating water management among many stakeholders, in particular the Klamath Reclamation Project management plan it establishes." Family Farm Alliance Western Water Management Case Studies, posted to KBC 9/28/10. KWUA/Klamath Water Users Association, and KWAPA/Klamath Water and Power Agency, describe a portion of their controversial willing seller and dam removal agreement, the KBRA, on FFA page 24: "KWAPA will evaluate the following measures to meet the purpose of the plan: conservation easements, forbearance agreements, conjunctive use programs, efficiency measures, land acquisitions, water acquisitions, groundwater development, groundwater substitution, other voluntary transactions, water storage, and any other applicable measures." KBC NOTE: The vast majority of the people, as shown in the polls and public meetings, oppose their "agreement". Klamath - When the wells run dry. Some Basin residents had to take out loans to deepen their domestic water source, H&N, posted 9/15/10. KBC REMINDER: See photos on top of this website; Klamath Basin was historically a huge lake; we diverted water OUT of the basin and INTO the Klamath River to grow food. Never before has this land gone dry except in 2001, and this year, when the government demanded more water to be diverted INTO the river. Dam removal could be closer; some say science is faulty, H&N, posted to KBC 8/17/10. "Mallams called the sediment study “a joke” and said it was heavily based on the flawed science of the 2006 studies, which were conducted by an environmental group...They had to go through three different modeling programs to get the results they wanted...Mallams added not all the results have been released, as scientists work through some of the data, which he said is being manipulated." Opponent testifies at committee hearing (in DC on KBRA), H&N, posted to KBC 8/8/10. "Mallams also said proponents sought to prevent him from testifying before the subcommittee, sending letters to its members." KBC NOTE: Klamath Water Users, environmental groups and government agencies have tried to sell the KBRA as creating a stable block of water for irrigators and a solution to preventing lawsuits. However, Craig Tucker, environmental activist, Karuk tribal spokesman, and a founder of the KBRA and Klamath Riverkeeper, explains the reality for irrigators: Probing the Klamath puzzle; public tells state and feds to look deep into dam removal, The Times-Standard, posted to KBC 7/24/10. "Addressing concerns about waivers of tribal water and fishing rights in the KBRA, Craig Tucker, Klamath campaign coordinator for the Karuk Tribe, said that the studies should aim to clear up misconceptions that tribes can't take legal action if those rights are impacted. He also defended the KBRA, saying that there are no guarantees of water for farms in the agreement, only a cap on how much can be diverted. 'What's capped in this agreement is agricultural water use,” Tucker said. “What's capped today is water for fish.'" State board okays a dam on Klamath, The Triplicate, posted to KBC 3/21/10. "The department was instrumental in getting the federal power commission to order the company to build the dam to regulate the stream, which has fluctuated in such a manner as to cause frequent fish kills and endanger human life on the Klamath below the existing COPCO dam." Congressman (McClintock) still against water deal, H&N 3/18/10. " A townhall meeting in Tulelake this past weekend only strengthened U. S . Rep. Tom McClintock’s opposition to the Klamath Basin Restoration Agreement, the congressman said. House Water and Power Subcommittee Oversight Hearing - Remarks by Representative Tom McClintock, Auburn Journal, posted to KBC 3/15/10. "Farmers in the Klamath Valley in California and Oregon are now threatened with another complete shut-off of water for the amusement of the sucker fish. While additional hydroelectric dams and reservoirs have been placed on a slow-track to nowhere, the fast-track has been reserved for dam destruction." California Farm Bureau Federation Friday Review of bills and laws, posted to KBC 3/7/10, covering California Tiger Salamander, the Williamson Act and the “gas tax swap”. Klamath Water Deal Faces First Big Test, OPB, posted to KBC 3/7/10." PCFFA/IFR Fishlinks: Klamath Settlement Agreements Signing, posted to KBC 2/22/10. "The two historic Agreements together would cap irrigation water demand in the upper Basin and add to water storage, putting between 130,000 and 230,000 acre-feet more water in the Klamath River for salmon... Included in the plan is the removal of four obsolete hydropower dams ...in what would be largest dam removal project in history." Editorial: What will this (Klamath)‘study’ show? Democrat Herald, posted 2/20/10. "The political decision to get rid of the dams and hydro power generators has already been made. This study is just a formality." Herald reader comment, "...Camp Dresser & McKee report for Interior that concluded the cost would be closer to a billion dollars for the dam removal alone, but that report was withheld from the public until after Oregonians voted on a measure to pay the dam-removal bill." Lawmakers remain concerned about (Klamath) deal, H&N 2/20/10 Obama administration, governors, and Klamath communities sign pact to restore river and local economies, Press Release by Klamath Agreement closed-door negotiators. "communities" did not sign and did not vote..their rulers did. 2/20/10. Schwarzenegger says water bond will be 'very challenging, Sac Bee 2/18/10 County discusses Klamath dam agreements, Siskiyou Daily 2/18/10. "...the study is only taking into account the economic impacts to the commercial fishing communities and not economic impacts to the county." GOOD COP BAD COP all in one person: International dam removal activist Craig Tucker, a lead organizer of the Klamath dam removal 'agreements', is featured in a 2008 International Rivers "Learning From the Pros" of dam removal activism. To further his campaign agenda, after organizing dam removal protests with Friends of the River against power companies, he hired on as campaign coordinator of the Karuk Tribe advocating dam removal and downsizing agriculture water allocations within the Klamath Basin Restoration Agreement / KBRA. At the same time he founded and is board member of Klamath Riverkeeper, an offshoot of dam removal group Friends of the River that opposes the KBRA. Karuk tribal leader and KBRA advocate Leaf Hilman is also a board member of Klamath Riverkeeper, KBRA opponent. 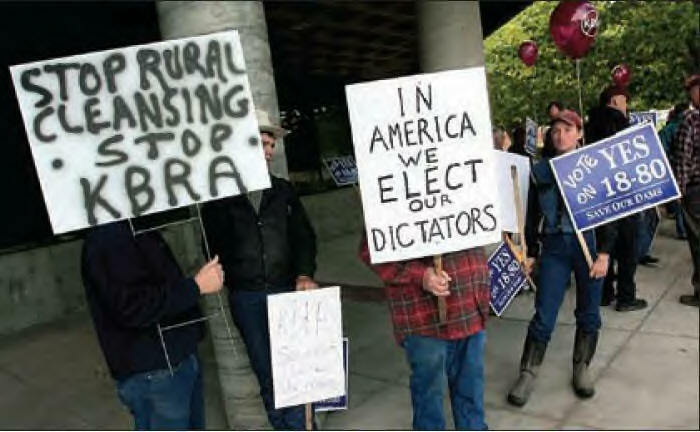 At the Klamath County Commissioners 1/27 public input meeting on the controversial Klamath Basin Restoration Agreement, the resounding plea by farmers and ranchers was, "Let us vote on it!" 400 farmers, ranchers, indians, environmental groups, attorneys and tribal biologists packed into the Klamath County Fairgrounds. The KBRA deal has big winners and losers who would lose all if the deal is signed. Tribal members were allowed by their Tribe to vote. Irrigators and community members are being denied that right. Give change a chance in the Klamath River, Times-Standard, posted to KBC 1/28/10, letter by Trout Unlimited; American Rivers; Pacific Coast Federation of Fishermen's Associations; Habitat Restoration Project Manager, National Center for Conservation Science & Policy; California Trout; Northern California Council Federation FlyFishers; Salmon River Restoration Council. "This will be the largest dam removal and river restoration project in the history of the United States...We also need improved streamflow and state and federal investment in broad-scale restoration from the sea to the headwaters...The KBRA will dramatically change management of the river giving more ability to Tribes and groups like ours to make the decisions on timing of flows and other restoration plans than leaving those responsibilities solely to government agencies." Final Klamath deal to go before (Humboldt) supervisors, 1/25/10. "If it signs the deals, Humboldt County would become a voting member in coordination and oversight groups, according to a Public Works Department staff report, which would allow it to influence the process and protect its interests." 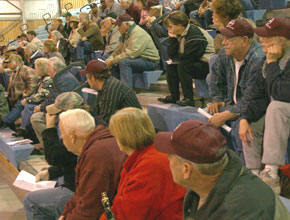 County to take public input January 27 on Settlement 'agreements'. Jackson Co. investigates whether KBRA could affect Rogue Valley water supply, KDRV 1/21/10 Klamath Tribes approve KBRA, H&N 1/21/10. (KBC NOTE: Project irrigators are not allowed to vote...? Yesterday Klamath Water Users Association put a notice on their website that tonight is the previously unadvertised "public briefing" on the Klamath Basin Restoration Agreement. There have been no ads or flyers or notices to KWUA constituents, only a mention in an article. Their website states it is a 'public briefing Q&A' rather than public input. Klamath County "public input" meeting will be Jan. 27. KID/Klamath Irrigation District intends to vote on the KBRA Jan 26. KMED Bill Meyers interview with Tom Mallams, Off Project irrigator, regarding Klamath Basin Restoration Agreement/KBRA and water for Rogue Valley. KMED-fallout from Mallam's interview, "Mallams is being peppered with emails and nasty calls from KBRA supporters. Words to the effect of "shut up", "you're telling lies". don't get Jackson County involved in this, etc." 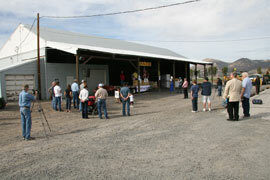 300 turn out for Senator Wyden's Klamath town hall, H&N, posted 1/9/10. "(The Klamath Basin Restoration Agreement) is not the kind of thing you do in the dead of the night without allowing people to comment,” he said." About the adjudication process, H&N 1/6/10. Pro: Settlement provides more flexibility H&N 1/6/10 KBC NOTE: Attorney Corbin is a member of National Fish and Wildlife Foundation, with partners Walmart - (Sam Walton is on the KBRA stakeholders email list because he owns a dam dismantling company), Turner Foundation, EPA, BLM, FWS, Forest Service, NOAA, etc. Every active contestant in the Klamath water adjudication is denyed a seat at the Settlement negotiation table. Resource Conservancy, representing the vast majority of Off Project irrigators, is not allowed at the table. Off Project ranch wife Becky Hyde, employed by Sustainable NW, which is employed by the Klamath Tribes, is the only Off Project representative at the secret negotiations who can negotate Off-Project water issues. From the archives: Storage still crucial to support farming, H&N editorial. KBC NOTE: The KBRA unveiled to the citizens today denies creating any off-stream storage to benefit agriculture. Final (Klamath) water deal near, H&N, 1/5/09. KBC Note: Last week we had 3 people from different people from different areas of the Klamath Basin call and tell us the "deal"/KBRA, is falling apart. Each said 3 mandates for the Project irrigators have been thrown out: water certainty, end of litigation, and 3 mil power rate, not to mention shelter from ESA mandates which was initially touted to the irrigators.